Today I'm excited to share with you a super easy snack that even your littles can put together. We used this idea for the brownie snacks badge and the girls loved it. There are so many ways to use this recipe! slice the bagels in half (open face). Try to get a brand that has them pre-sliced to make your life easier. Spoon 2 spoonfuls of sauce on each half and use the back of the spoon to spread. If you want to take it a step further you can pop them in an oven at 350 degrees for 8-10 minutes. These make a great after school snack or you can pack the components in their lunch for a pizza lunchable. I would recommend getting the little cups to put the sauce and cheese in. When we did this with our girl scout troop I had the sauce and cheese divided into these cups for them to make it slightly more organized. You can also store the cheese and sauce cups in your fridge so the kids can help themselves. 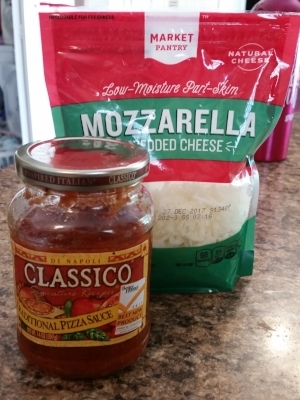 Posted on September 12, 2017 by Katie D. and filed under Camping, Food, Girl scouts and tagged pizza bagel mini pizza pizza snacks after school Brownie badges girl scout food kid recipes kid friendly.